I’ve been blessed with many helpful people who have shaped my life. There was my Uncle Jim who would hurry home from being a conductor on the No 19 bus route to help me do my homework and when the Arsenal weren’t playing, take me to the magical Astoria cinema. There was my boss in advertising, Colin Milward who allowed me to experiment with a camera, learning to make TV commercials in the agency basement and who then “sacked” me, forcing me to take up directing full time. There was my friend Fred Zinnemann, the great film director, who politely critiqued each new film of mine with the deft expertise of a Vienese abattoir butcher. But I’ve chosen to write about my old Boys Brigade leader, Terry Currey. 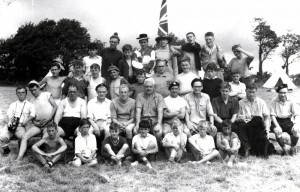 Growing up in Islington, North London, in the fifties before the area’s gradual gentrification, the Boys Brigade wasn’t just a marching band, heard for miles around on the last Sunday of every month: it was our boys’ club; the only one around. There were the Boy Scouts at St Mary’s but curiously they were thought too posh and sissy for us working class kids from the council flats. Located in the dingy Victorian basement of the old Islington Chapel in Gaskin Street, the BB supplied all our needs every day of the week, week in week out, as it dominated and defined our lives. For most of my time there it was organised and presided over by Terry Currey. Mr Currey, as we always called him, was officially the “Captain” of the 17th London Company of the B.B. Monday night was ‘club’ night (table tennis, darts and snooker), Tuesdays, gymnastics, as we deftly dodged the iron pillars that supported the chapel upstairs. Wednesdays, swimming at the tupenny bath at ‘The Tib’, the Public Baths off Essex Road; Thursdays, band practise or athletics in between football seasons (which seemed to stretch through the whole year – ignoring cricket, which wasn’t big in Islington). Band night was eventually abandoned because we had the distinction of being the worst drum and bugle band in Britain. Fridays were “drill night” where we spruced up in starched white haversack and polished belt and marched up and down with as much precision as a guardsman after a bucket of vodka. Saturday afternoon was football at which we excelled – no mean feat considering that most of us were exhausted, having already played a game in the morning for our schools. Our success on the football field was mainly due to our brilliant captain, Peter Shreeves, who ended up, for a brief time, as the manager of Spurs. (A heretical thought to all of us who grew up so close to Highbury and Arsenal.) Sundays, a priority for Mr Currey, if not for us kids, was Bible Class. One hour every Sunday morning, and if you didn’t turn up you couldn’t enjoy the rest of the week’s activities. That was the catch. Our spirtual diet was always followed by our ritual trip to Chapel Street Market and a regular visit to the sarsaparilla and apple fritters stalls. Mr Currey organised everything with tireless patience and an enthusiasm that bordered on crazy, considering the bedlam we mostly engendered. Not that we appreciated this skinny, pallid faced man with curly hair and big geeky glasses at the time. His ‘day job’ was a postman and we would giggle whenever we caught sight of him in his uniform, riding his bike along Upper Street with a huge canvas sack over his shoulder. He had a family of his own (his wife, Hilda, also an avid church person, oversaw the sister organisation, the Girls’ Brigade – any contact with the members of which was strictly discouraged) but night after night, Mr Currey devoted his life to us scruffy, ungrateful hooligans. Whenever we turned up at ‘all London’ B.B. marching functions we were a shambles: always the worst turned out, eliciting derisory groans from the other London companies with their shiny, magnificent bands flanked with sergeants and corporals, their arms sparkling with acres of metal proficiency badges. Bringing up the rear, we would shuffle along, our ‘band’ section more for show than musical pleasure. It was hard enough to keep in step let alone bash a drum at the same time. Our incompetence was lost on Mr Currey, however, as he proudly marched at our side, seemingly oblivious as to our awfulness. Curiously, he was an excellent musician himself, which must have been exasperating for him, although he never showed it. He played the church organ in the chapel upstairs and at the annual summer camp in West Wittering — the only holiday for most of us kids — he would pump away at his piano accordion with gusto. We would all squawk along enthusiastically, “She’ll be coming ‘round the mountain, when she comes…” whilst sipping the weakest, most hideous cocoa ever brewed, sheltered from the rain under leaky, mildewy ex-army tents probably captured from Rommel. We loved it. I never could understand why this gentle man would give so much of his time to we grubby ingrates. It’s easy to be cynical looking back – certainly he was driven along by his Christian faith but, in a way, he was a religious Canute, as the world washed by and the more secular times we were living in were changing so rapidly. 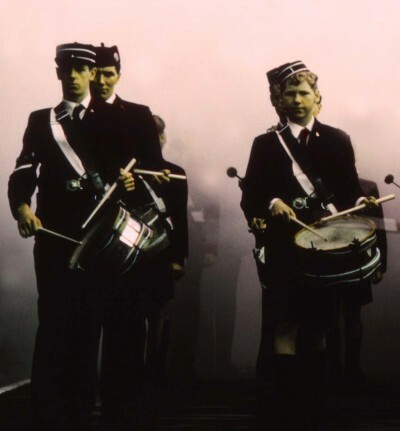 The Boys Brigade had been started in the slums of Glasgow by William Smith in 1883 and even by the late 1950’s learning to play the bugle, whilst wearing a daft pill-box hat, was losing its charm as Elvis, Lonnie Donegan and ‘Dance Night’ at the Tottenham Royal gradually distracted us. But Mr Currey never lost faith. Indeed, he went on persevering for another forty years until he finally threw in the towel when the once populous 17th was down to a membership of just two boys – both of them, I think, his relatives. I wrote a letter to him at the time because I knew what a choker it would have been for him, having struggled for so long to keep the Company and his ideals afloat. With the benefit of hindsight and grey hair, I realise how much we actually admired him. Hardly any of us ended up religious, as he had probably hoped – as the kid who got to the Grammar school I was always the one who had to read the lesson from the Bible on Sundays, proficiency in reading not being the strong point of my more sporting fellow company members. The B.B. was a significant part of our lives. In a taxi last year, the cabbie looked in his rear view mirror and said to me, “I know you. You’re little Alan Parker.” Hence followed a lengthy conversation about my movies, Arsenal but mostly our B.B. days, with a fellow 17th boy (older than me, hence, I hope, the explanation for the diminutive). So why was Mr Currey important to us – this bespectacled, lanky, not overly educated, pasty-faced postman who played the accordion, made bad cocoa, lost at table tennis and spoke to us of Jesus? We admired him because of his, maybe ingenuous, lack of guile. He gave his time to us because he genuinely believed that helping us bunch of scruffs was worthwhile. Trite as it might sound, Mr Currey was a genuinely “good” man. He had an innate decency, modesty and genuine, selfless values that maybe were missing in our normal lives, and indeed were probably frowned upon on those cynical street corners. We never thought of him or treated him as a hero but, without us even knowing it, or him ever seeking it, he was an extraordinary example to us all. I have lived a good many years since my B.B. days, but have yet to meet a better man.